Three batteries, just for the radio? 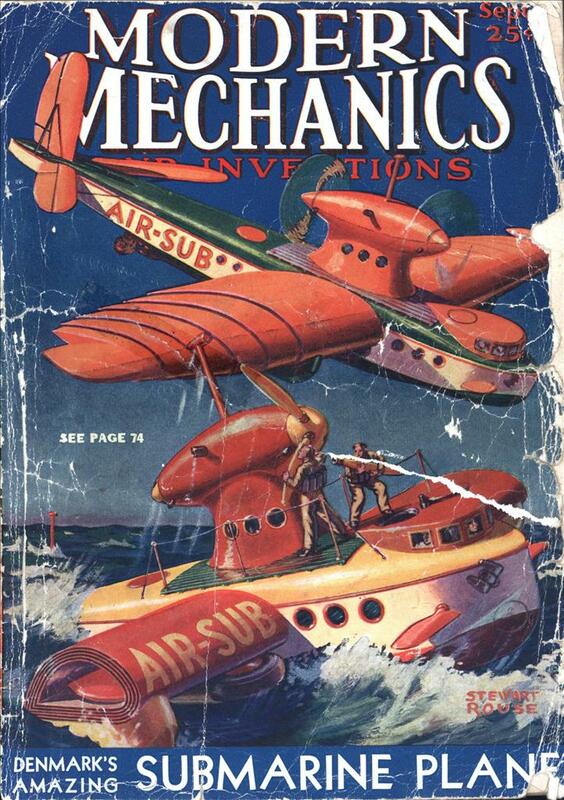 RADIO, it seems, is destined to be installed in everything that flies, runs on wheels, or floats on water. The fast moving auto is the latest vehicle to be invaded by radio’s onward march. 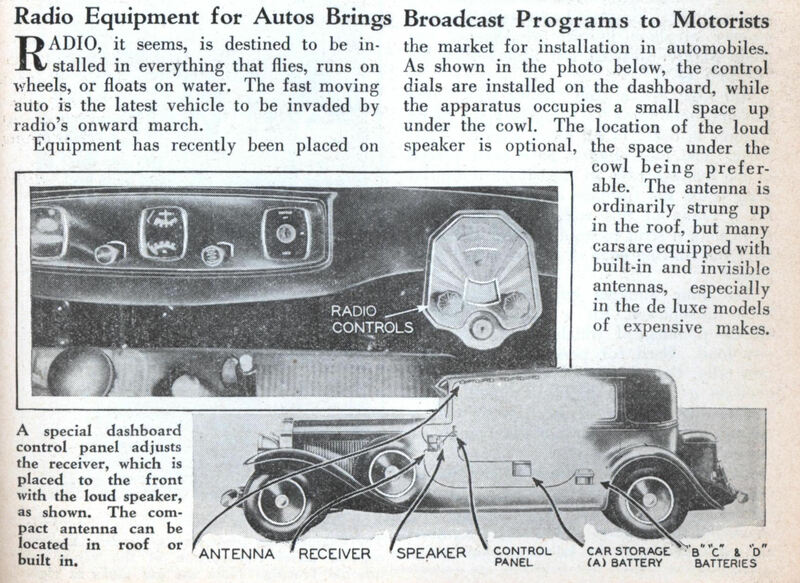 Equipment has recently been placed on the market for installation in automobiles. As shown in the photo below, the control dials are installed on the dashboard, while the apparatus occupies a small space up under the cowl. The location of the loud speaker is optional, the space under the cowl being preferable. The antenna is ordinarily strung up in the roof, but many cars are equipped with built-in and invisible antennas, especially in the de luxe models of expensive makes. Tube radios need at least 2 different power supplies to work. The A battery is the low voltage battery, 6 volts in this case, that is needed to heat the tubes for them to work. The B battery is the high voltage, most likely 90 volts, this is what the tubes use directly. The C battery is 4.5 volts that the radio uses to vary the current in the tubes to amplify signals, later radios used more complex circuits to eliminate the need for a separate battery. I have never seen reference to a D radio battery, but it has nothing to do with what we think of as modern “D” batteries. All of these where later eliminated with transformers in home radios and special circuits in car radios that used only the 6 volts from the battery (this is before cars became standardized at 12 volts). What we commonly refer to now as batteries are usually cells. For example, an A-battery is really an A-cell. A battery is a group of cells; connected in series for higher voltage, or connected in parallel for higher amperage. So a 12-volt car battery is a group of 2-volt cells in series. But if you go to a store and ask for an A-cell, you’ll probably get a blank look, so you’re better off calling it a battery . . . even though the terminology is wrong . . . .
What we commonly refer to as batteries are often actually cells. For example, a C-battery is really a C-cell. A battery is a group of cells; connected in series for higher voltage, or connected in parallel for higher amperage. So a 12-volt car battery is a group of 2-volt cells in series and a 9-volt smoke detector battery is a group of 1.5-volt cells in series. But if you go to a store and ask for a C-cell, you’ll probably get a blank look, so you’re better off calling it a battery . . . even though the terminology is wrong . . . . Were all the batteries charged off the car generator or did you have to take out and recharge/replace the “B” “C” and “D” batteries every so often?